In India and other countries, cinema is inseparable from one's life. For thousands, it provides livelihood and for millions, it is an escape into a fantasy world. This imaginary world could be splendid, perfect, or filled with love and joy. Or it could be nothing but struggle, pain, disappointment and misery. There is no perfect formula to create a memorable and long lasting cinema. Or is there? 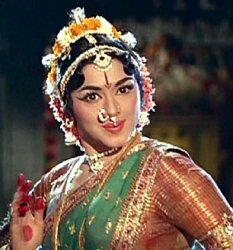 Classical dancing was also brought to the silver screen decades before Manju Bhargavi. Lalitha, Padmini and Ragini are known as the Travancore sisters from Kerala. They were all leading actresses and dancers in South India and acted in several Hindi cinemas also. Dancer and actress Shobhana is their niece - brother's daughter. Among the sisters, Padmini has had the most successful career. She has acted in more than 250 movies and some of the movies she acted in are classics, even today - Thillana Mohanambal is a great example. Then came Hema Malini, who looked and danced absolutely stunning in every cinema she made. 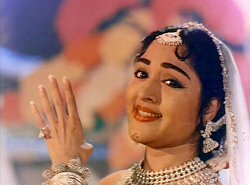 Along with her predecessors, Padmini and Vyjayanthimala, she popularized classical dancing in and outside the movies. Now in her late 50's, she is still an amazing dancer who travels with her dance company around the world. It starred legendary Kathak maestro Gopi Krishna, opposite Shantaram's wife Sandhya, who was also a terrific dancer. 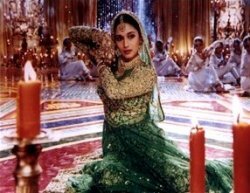 Jhanak Jhanak Payal Baaje had the best Kathak dance sequences, colorful costumes, elaborate set pieces and melodious music. The great dancer Mangal Maharaj wants his son Giridhar to follow his footsteps and win the title of ‘Bharat Natraj'. But first they need to find a dance partner. None could measure up to their standards. Then, they discover a young woman named Neela who agrees to study under Mangal. But Giridhar and Neela begin to fall in love, which enrages Mangal so much that he injures Giridhar”s leg to separate the two. But of course, things work out in the end; Giridhar wins the title and the love of Neela. V Shantaram said that the film made a case for preserving the purity of Indian artistic traditions against the onslaught of the West (in 1955!!). Surprisingly, the audience loved this terribly self-indulgent piece of work and it reportedly ran for 104 weeks and won the President's Gold Medal for best film. It is one of the top grosser of all time. Padma is the artistic director of Cultural Centre of India. She is trained in Bharata Natyam, Kuchipudi, Andhra Natyam, and Mohini Attam. Padma extensively writes articles about dance and dance education. Padma Chebrolu's background in education includes MBA and M.ED from US. She also has a degree in Bharata Natyam from India. She works as a software engineer at a major corporation. She lives with her husband and two children in Cincinnati.